Colombians love Estofados. 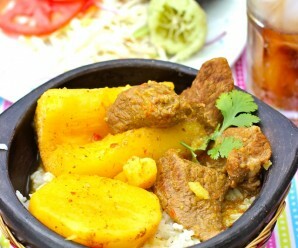 We make them with chicken,fish,beef and pork served over white rice. 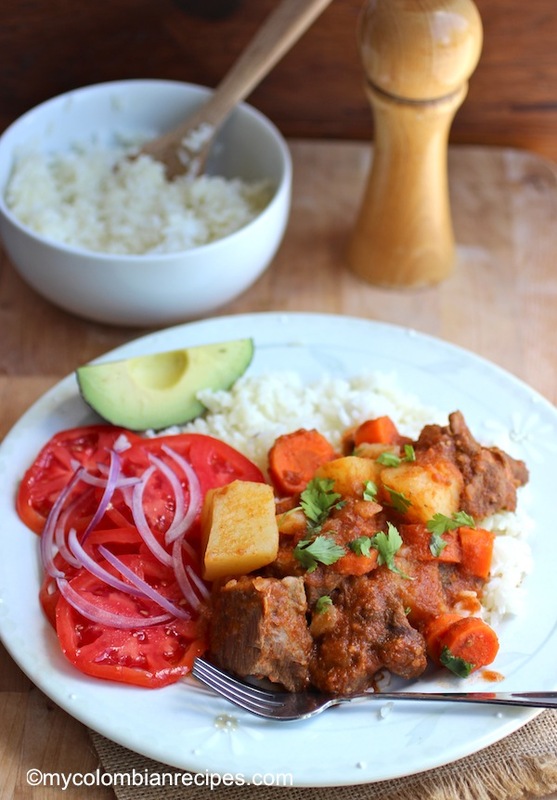 This Beef Stew in Tomato Sauce (Estofado de Res) is very rich, with the tomato sauce base adding a sweetness to the dish. 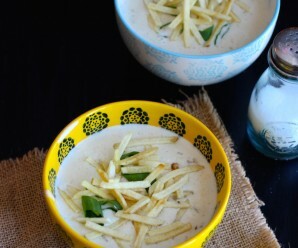 This dish is a bowl of pure dish comfort loaded with flavor. Best of all, it’s easy to put together! Heat the oil in a large pot over medium heat. Add the onions, garlic and cook for about 4 minutes or until the onions are translucent. Coat the beef chunks with the flour and add to the pot, stirring occasionally, until lightly browned. Add the tomato sauce, beef stock, bay leaf, salt, cumin powder and bring to a boil, then reduce the heat to medium low, cover and let it cook for about 1 hour and 10 minutes or until the meat is tender. Add the potatoes and carrots. Cover and cook for an additional 30 minutes or until the potatoes and carrots are tender. The cumin is a great addition to the beef stew! Wonderful flavors! 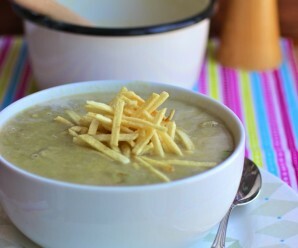 Yum, I make this dishes as this one a lot, especially in winter time! Your version looks great! Yum Yum Yum! I miss to cook this dish, we have something similar. I use red wine in mine. It looks delicious. The way you made this recipe sounds delicious! Meat, here, seems to always be tough so using a slow-cooker to cook it slowly for a long period is a great way of making it more tender. Instead of using potatoes, I often use dumplings popped into the pot about an hour before serving so that they are light and fluffy. This looks so hearty and delicious. I’m bookmarking it to try soon! I also appreciate knowing that this can also be used with other types of meat! 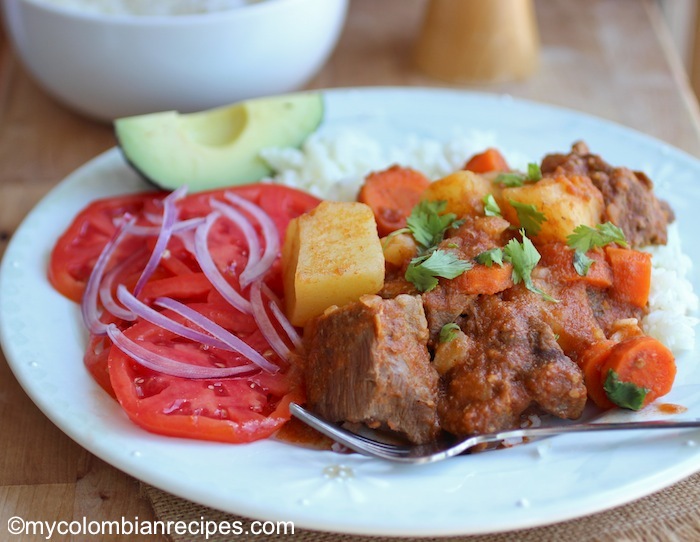 I love to cook Colombian meals and want to try everything what I tasted before! I tried your recipe and served it to my mother and best friend. You know what happened, they finished the whole casserole , nothing was left after dinner! Your website is just perfect, do not mind the grammar, you are doing fine! Thank you so much for the feedback and for the very nice comment! Thanks for the great recipe. I will be trying it soon. I am half Colombian but never got to experience the culture at all. Now that I have grown I am more curious and want to know more about it. The food culture etc. This is the ultimate comfort food! I bet the cumin and bay leaf are delicious. Thanks for posting! 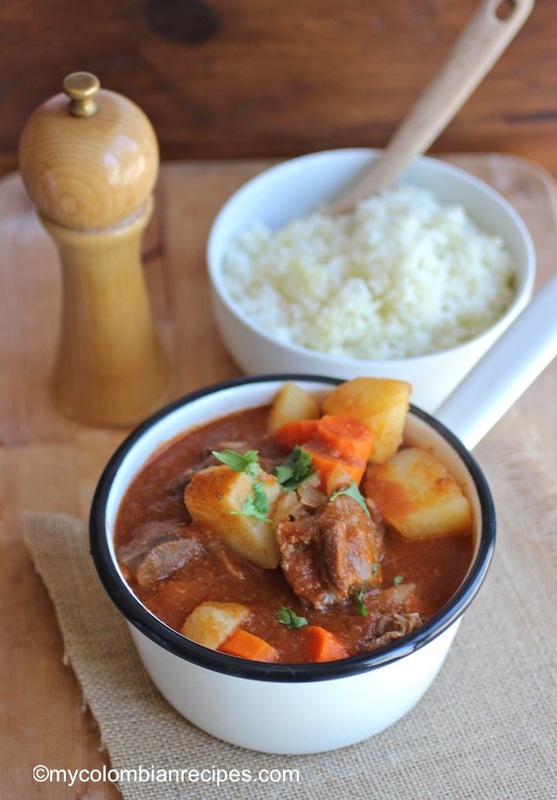 I grew up loving my Mom’s beef stew but it doesn’t compare to this. I followed the directions exactly and it was perfect. The meat was so tender and the next time I am going to make a double batch for more leftovers. se ve facil la receta ahora vere si tengo exito en la elaboracion gracia x la receta. OMG…I’m so glad I came across your site!! 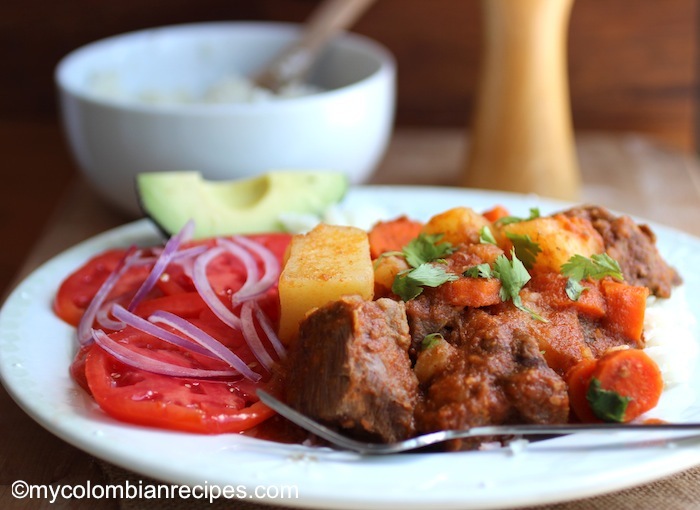 Your Colombian recipes are great!! 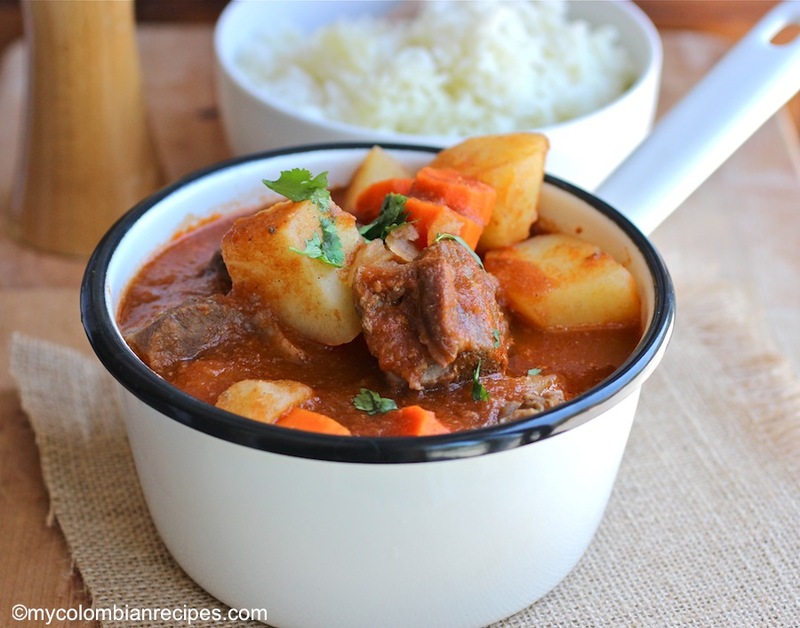 They are very similar, if not almost identical to my mother’s cooking, which I believe it’s because she is also from Antioquia, Medellin. I’m off at college and there are days I miss my mother’s Colombian cooking and I hate to call her and bother her all the time asking how to make stuff. 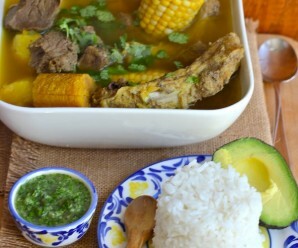 I’ve been looking for a recipe on pasteles de pollo but have yet to find one. My mother says she’s never made them before so I don’t know if maybe they aren’t common in Medellin. Thank you so much for posting your recipes! They are awesome! Thank you, this was delicious!!! What kind of tomatoe sauce do you use? Your favorite canned tomato sauce. I made this last night and was so happy with how it turned out. Absolutely delicious!